Flat shoes this season…but how? | StyleAble Fashion For Everyone! Flat shoes this season…but how? To those of you who believe that footwear should be practical above all things, I say that you just haven’t found the right designer yet. The season’s trend for flat shoes will see some of the most fashion concious amongst us opting for double strap flat sandals, like the new Givenchy’s or the infamous Birkenstocks. (I say infamous because I find them to be deeply unflattering on any but the most dainty of feet). I won’t be committing to a pair of slip-on’s myself, however, I have been looking for the perfect pair of flats – so far, not so good. As usual, there is a distinct lack of flattering, heelless shoes that do not look overly casual. This means, that in my wardrobe I am left with only a couple of carefully chosen pairs (which I am currently wearing to pieces) and I am desperate for more. In a recent post on the Man Repeller, Editor, Leandra Medine put forward an interesting argument on opting for ballet flats (again) this season. Despite her witty writing, I had to stifle a yawn as she talked about her combination of jeans and ballet pumps. It was nothing personal, I have simply had my fill of a style which became a staple a few seasons ago, and of which we have seen every variation done to death. Some of us never stopped wearing them. So what else is there? I heard somewhere that flat shoes can also make you look ‘basic’ (may have been the the Man Repeller again) a little harsh, but I get it. Finding flat shoes that do not give you the look of having stumpy legs, wide or long feet, or make every outfit look ‘so, so’ rather than’wow’ is no mean feat. That said, I recently came across a few designers who have succeeded where others have so often failed. My favourite was Robert Clergerie. Why? Two reasons. Rose Gold Leather Guardia Sandals (top pic) and Pewter Studded Jaclou Brogues (below). Ok, they are not cheap but they are not break the bank, kill me now either. At £355 and £455 a pair, these shoes hold the answer to every question I have ever asked about how to wear flats without losing glam points. Will they look good with jeans and trousers? Yes. Will they work in the office and for functions? Absolutely. Will they make me feel as if I have sold my soul in exchange for the most beautiful shoes in the world?…you get my point. 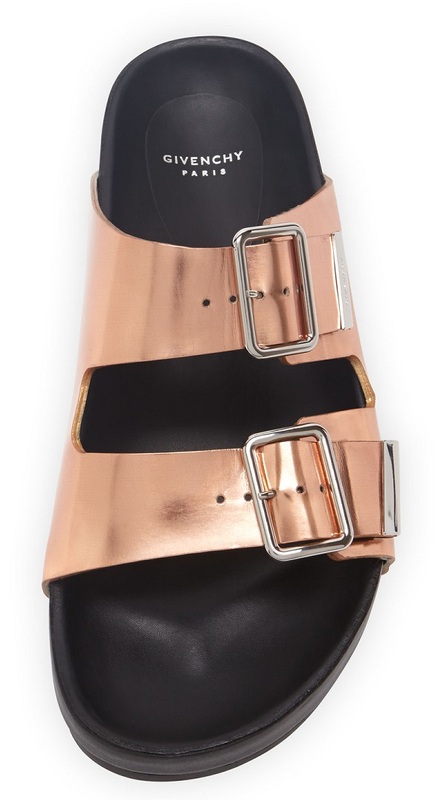 These are flats that pretty much do it all and the fact that they come in rose gold metallic is noteworthy. 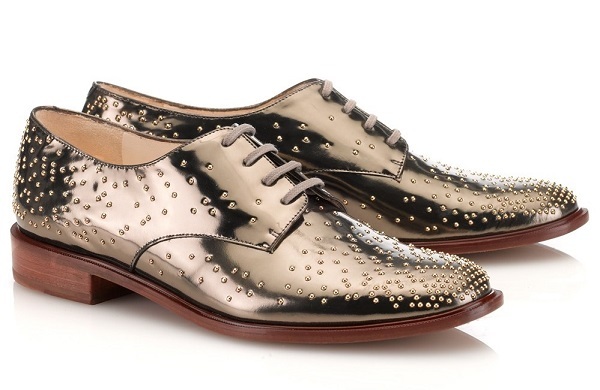 For those of us who do not have the budget for these beauties, you may find a similar style on the high street. Either way, ballet flats are officially yesterday’s shoe.